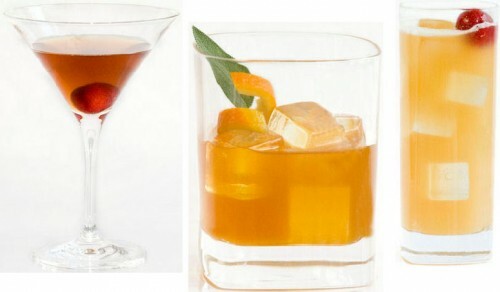 September is National Bourbon Heritage Month– celebrate the last days of the month and the rest of the season with these three recipes provided by Wild Turkey Bourbon. Muddle ginger, mint, powdered sugar and bitters in a cocktail shaker. Add Wild Turkey Bourbon, vermouth and ice. Shake and strain into a chilled glass. Slice cherry from top to bottom five times around pit, and soak in a cup of Amaretto. Muddle cider, sage, saffron, brown sugar, orange twists and zest together in glass. Add Wild Turkey Bourbon and stir. Strain and serve over ice, garnish with Amaretto-soaked cherry. Slice cherry from top to bottom five times around pit, and soak in a cup of Wild Turkey American Honey. Combine Wild Turkey Bourbon, grapefruit juice, lime juice and honey in a cocktail shaker. Froth egg white and add a dollop to the mixture. Shake and serve over ice. Garnish with Wild Turkey American Honey-soaked cherry.